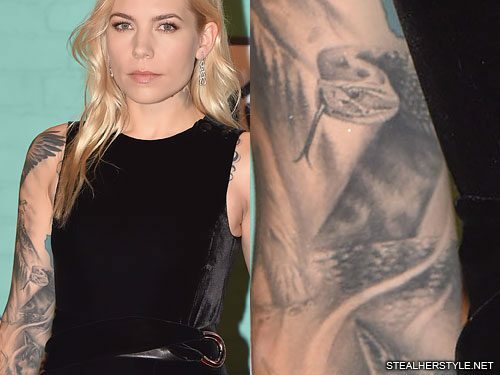 Artist Tye Harris’s final additions to Skylar Grey’s woodland-inspired full sleeve tattoo include this snake on the inside of her upper right arm, just above the elbow. 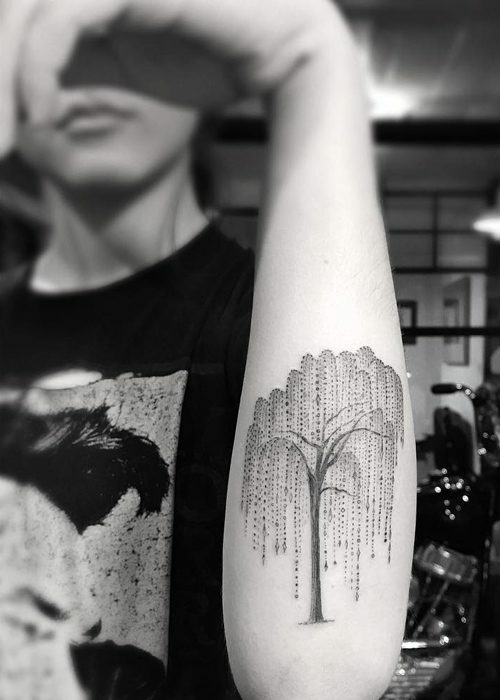 Skylar Grey adds some more artwork to her right upper arm to make a full sleeve design. 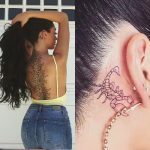 The new highly-detailed tattoos are a bald eagle and a grizzly bear in front of mountains. 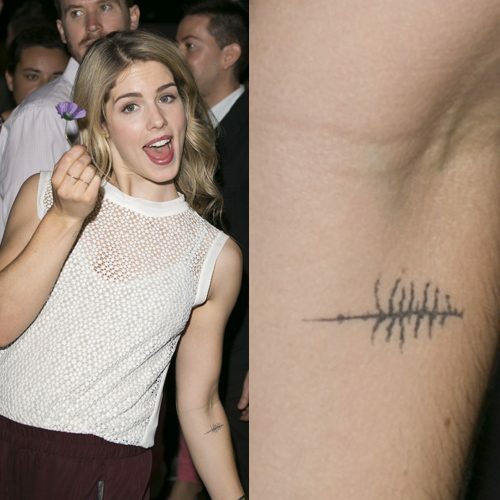 Emily Bett Rickards has a tree design ink on her left forearm, bellow her elbow. Deepika Padukone has beautiful floral pattern tattoo on her left ankle. 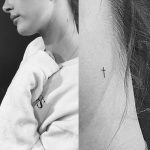 Interestingly, this tattoo has her initials ‘DP’ at the end. 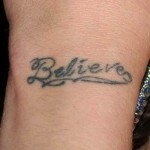 Frances Bean Cobain has a willow tree tattoo on her left forearm made by artist Dr. Woo. 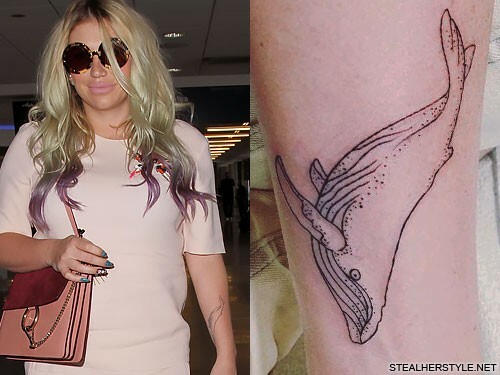 Kesha got a tattoo of a humpback whale on her left forearm from artist Matt Ahn at Invisible NYC in January 2016. 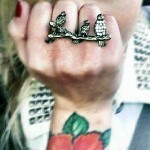 “Save the whales save the whales save the whales – gorgeous ink from @[email protected] thank u! I love my whale! it reminds me of when I deep dive with them in the oceannnnnn,” she wrote. 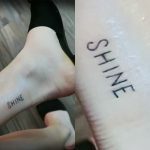 She has nicknamed her tattoo “Stuart.” Kesha loves sea creature so much that she gave herself a second whale tattoo a few months later. 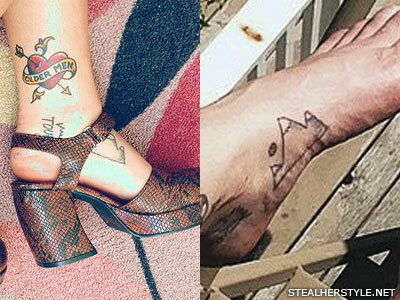 Sierra Kusterbeck has a mountain range with three snow-topped peaks tattooed on the inside of her left foot. 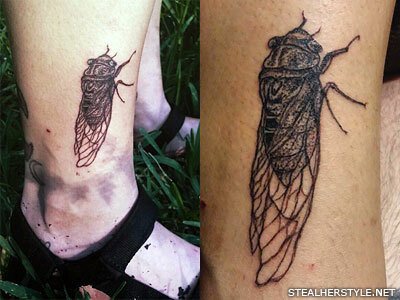 Sierra Kusterbeck got this cicada tattoo on her right ankle in May 2015 as a tribute to her home state of Florida and its swamps. 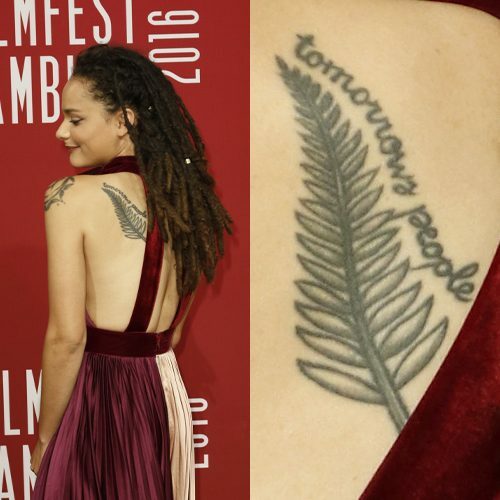 Her friend Mitchell has a matching tattoo on the top of his foot. 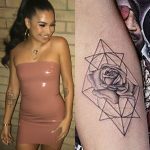 Their tattoos were done by Allen Leper, who had never tattooed a person before, but it looks a lot more professional than most of Sierra’s other DIY tattoos!